Anyone who’s dog has had cancer will know the fear and feeling of helplessness that comes with the diagnosis. Fear of the unknown and what will happen to them. Helplessness because you have to entrust their care and wellbeing to the professionals. Nonetheless, upon hearing the words ‘your dog has cancer’, a lot of people take to the internet to research what they can do to increase their dog’s chances of surviving. Unfortunately, despite what some quacks and websites will have you believe, there’s nothing you can do to actually treat your dog’s cancer. This is best left to the oncologist and vets. But there are things you can do to improve and manage your dog’s broader health as they go through treatment. In particular, paying close attention to what you feed your dog could serve them well as they go through this difficult time. That’s because in dogs who have cancer, both the disease and the treatment can affect their appetite and weight. It can also affect how your dog’s body utilises nutrients and tolerates certain foods. A good diet during cancer treatment can help keep your dog’s strength and energy up, make them feel better, heal and recover faster and sometimes, make them better tolerate treatment and the side effects that go with it. It can also help them maintain a healthy weight and prevent or reduce the effects of cachexia (muscle wasting associated with cancer treatment). There are over 200 types of cancer, and over 300 breeds of dog. It’s therefore not surprising that cancer affects every dog differently. In turn, this means there’s no one single ‘cancer diet’ that should be given to all dogs. And that there’s no one single food or food type that will be of benefit to your dog while they’re undergoing treatment. What it does mean is that to help give your dog the best chances of beating cancer, you’ll need to create a diet that’s bespoke to them and their cancer. Things to consider when determining what you should feed your dog during cancer treatment include what kind of dog they are, how old they are, what type of cancer they have, what stage cancer they have and what treatment they’re having. Broadly speaking, there are some general guidelines which are important when considering what to feed your dog as they go through their cancer treatment. As with any diet, when developing a diet for a dog with cancer, it’s important to include the correct mix and type of protein, fats, carbohydrates, minerals and vitamins. Fats are also important to include in your dog’s ‘cancer diet’ because they’re a rich source of energy. Be considerate of the types of fat your feeding your dog – by and large, if you are adding fat as an energy source only it’s best to stick to fats low in omega-6 such as coconut oil or olive oil. If you want to provide a specific essential fatty acid such as linoleic acid (an omega-6 fatty acid), good options are chicken fat or corn oil. You might have seen flaxseed oil being promoted as an alternative to fish oil. Flaxseed oil contains the omega-3 fatty acid ALA (alpha-linolenic acid). The problem with ALA is that for the dogs body to use it, it must be converted into EPA and DHA – the omega-3’s found in fish oil. Your dog’s body doesn’t do this conversion very well. As a result, only a small fraction of flaxseed oil has omega-3’s effects. Carbohydrates are often made the villain of ‘cancer’ diets. You may have heard that they feed cancer cells and cause cancer to grow. The relationship between cancer cells and carbohydrates is complex. While it’s certainly advisable to avoid foods with a high Glycemic Index (GI), elimination of carbohydrates all together can backfire. Carbohydrates act as fuel for everything the body does, avoiding them could leave your dogs healthy cells low on energy. Conveniently, fruits and vegetables also contain high level of antioxidants, which delay or prevent cell damage. Never include antioxidant supplements in your dogs ‘cancer diet’, especially if your dog is undergoing cancer treatment. This is because there’s evidence to suggest that supplementing them over the daily nutritional needs may interfere with chemotherapy and radiation and in turn, hinder or delay your dog getting better. Vitamin C in particular has shown to promote the oxidation of cells and thus cell damage if given in larger doses. Other supplements and medications your dog is taking may also interfere with their treatment, so it’s important you tell your vet and the oncologist about them as soon as your dog is diagnosed. Don’t assume that just because something is ‘natural,’ it’s safe. As well as considering the quality of all the foods you’re feeding a dog with cancer, it’s important to think about the quantity. This is because a common side effect of chemotherapy and radiotherapy (two of the most common ways cancer is treated) is loss of appetite. 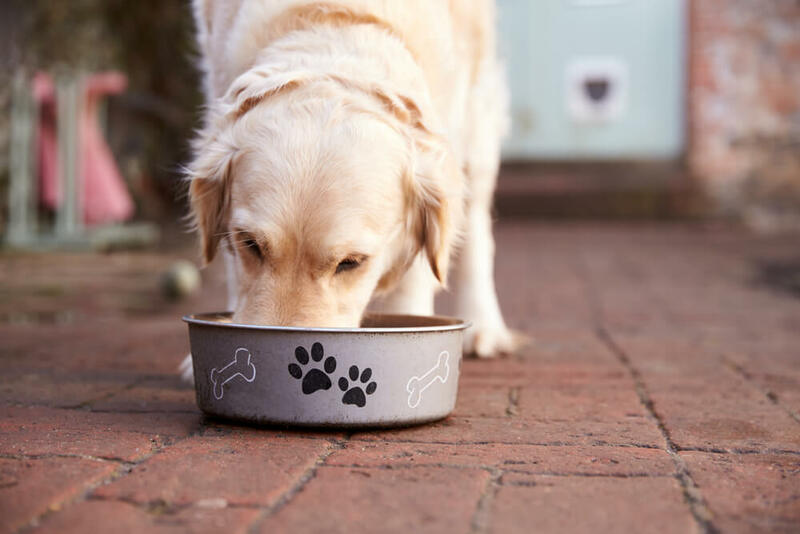 If your dog is struggling to eat, it could be an idea to feed smaller portions on a more regular basis, as opposed to the standard two to three meals a day. It’s also important to think about the calorie and nutrient content within the food you’re giving them. Calorie/nutrient dense foods limit the volume necessary to meet your dogs nutritional needs. No one wants to be given the news that their dog has cancer. But if you find yourself in this position, don’t despair. There are lots of amazing treatments available which everyday are helping countless canines across the globe beat this devastating disease. You can help make sure your dog is among those who survive by speaking to the experts, listening to their advice, and caring for your dog, including giving them the best possible diet for them. If you are interested in home cooking for your dog, it’s important to get your recipe from a qualified nutritionist rather than following a recipe found online or in a book. A home-prepared diet should not be undertaken lightly and should be done by someone who will work with your dog making sure that calorie and essential nutrient needs are met. Why did my dog get cancer? This entry was posted in Blog and tagged best diet, cancer, diet, dog, food, supplements.